The PRO285Xs all terrain wheels roll over anything with ease, and it folds down and opens up with a quick lift and pull. Set up for your tailgate, or picnic. Hang the cart on the wall for easy storage, or pull it along with you when you travel. The cart features spacious side shelves for prep and integrated towel and tool holders too! Everything you need for successful grilling on the go. The grill itself has 12,000 BTUs of power easily provided by a 1.2 lb. propane tank. Whether tailgating, picnicking, adventuring, or just relaxing at home, the Napoleon PRO285X with Scissor Cart is the perfect little grill that provides big results. Folds compact, but sets up in seconds. LEX605 Built-In Gas BBQ with Infrared Bottom & Rear-Burners Your outdoor gourmet kitchen awaits with the addition of the Napoleon Built-in LEX 605 Grill Head. This grill head will allow you to entertain well after dark with the stylish backlit control knobs. Napoleons JETFIRE ignition system makes sure that your grill lights every time by shooting a jet of flame to light the burners. Sear quickly over the integrated infrared bottom burner. Cook all of your favourite foods on a grill that fits perfectly in to your ideal outdoor kitchen. 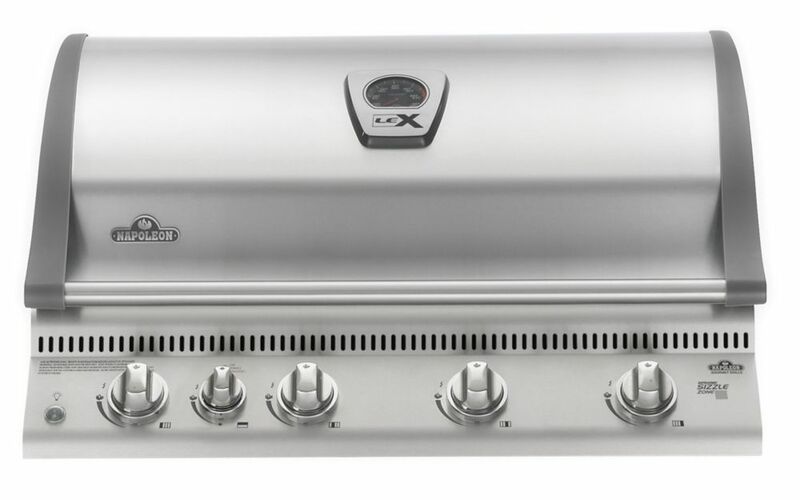 LEX605 Built-In Gas BBQ with Infrared Bottom & Rear-Burners is rated 4.0 out of 5 by 4. This is a propane BBQ, you would have to order a natural gas unit.